Treatment of HLE and HLF cells with TGFβRI inhibitor LY2157299 led to dose-dependent loss of GLI2 levels. Cancer Research, 2014, 74(21): 5963-77 . Galunisertib (LY2157299) purchased from Selleck. Representative images of 53BP1 foci in HPV− primary HNSCC “G”. Number of 53BP1 foci per cell in irradiated (4 Gy) HPV− (white) and HPV+ (red) HNSCC specimens pretreated with (hatched) or without (open) LY2157299 at 5 hours post irradiation (right). Clin Cancer Res, 2018, doi:10.1158/1078-0432.CCR-18-1346. Galunisertib (LY2157299) purchased from Selleck. Cells were treated in both formats with 10 uM of SB525334 (TGFβR1), SJN 2511 (TGFβR1), LY2157299 (TGFβR2, TGFβR1), Dorsomorphin (AMPK, ALK2, ALK3, ALK6), DMH-1 (ALK2), or GW5074 (c-raf), or 50 ng/ml of TGF-β. Microtissue or tissue-culture well fluorescence for each condition are shown after 3 days of culture for 393T5 cells, which proliferate slower in control conditions, so that the two cell lines undergo the same number of population doublings during each assay. Lab Chip 2013 13(10), 1969-78. Galunisertib (LY2157299) purchased from Selleck. Immunofluorescence of SMα (Red) and VE-cadherin (Red) combined with DAPI (blue) revealed that VM markers were elevated in DMSO-treated NHA/A172 cells but not in galunisertib-treated NHA/A172 cells. Sci Rep, 2016, 6:23056.. Galunisertib (LY2157299) purchased from Selleck. Mundla SR, Patent, 2006, US7872020. Yingling JM, et al. Proc Am Assoc Cancer Res. 2006, 47, abstract 250. Zhou L, et al. Cancer Res, 2011, 71(3), 955-963. Parsons S, et al. 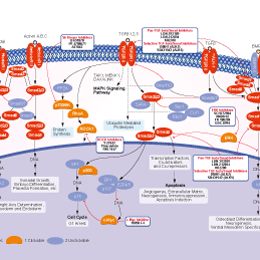 Mol Cancer Ther, 2011, 10(11), Suppl 1, Abst C201. Bueno L, et al. Eur J Cancer, 2008, 44(1), 142-150. Liu Z, et al. J Cell Sci, 2009, 122(18), 3294-3302. GW788388 : TGF-β receptor type I/II dual inhibitor, Ki=38 nM/300 nM. SB431542 : Potent and selective inhibitor of ALK5 with IC50 of 94 nM, 100-fold more selective for ALK5 than p38 MAPK and other kinases.